This entry was posted on August 11, 2013 at 7:48 am and is filed under CYCLING PROMOTION, CYCLING THINKING. You can follow any responses to this entry through the RSS 2.0 feed. You can leave a response, or trackback from your own site. Great news. I look forward to reading this book. The research project has made a significant contribution to ideas for change here in Leicester. 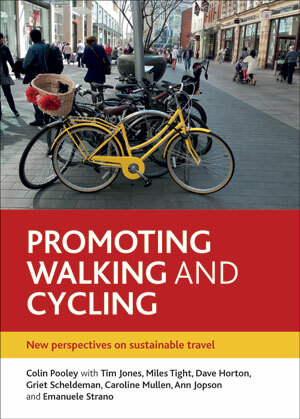 It has also given substance to the national debate on road space reallocation, active travel and ambitions for 21st Century people-friendly cities ‘Fit for cycling’, walking and all forms of active people-power. Well done, Dave! I can’t wait to get my hands on it! See you in September. Thanks Nigel, though I’m not sure why you find the conclusions depressing, unless it’s because they spell out the scale of the changes needed to make walking and cycling normal; but then I’d have thought that was fairly obvious? I don’t want to deny your reaction/s, but I suppose I feel slightly duty-bound to say I, perhaps to the contrary, find our conclusions inspiring and potentially empowering, in that rather than continue with the pretence that meaningful change is just (always!) around the corner, the book sets out what many people in their hearts I’m sure already know to be the case – that positive sentiments around walking and cycling are only so much bluster so long as politicians, decision-makers, the media, and institutions of all kinds continue to treat the car as the normal means of moving around and pay at most only lip service to walking and cycling. Thanks very much for reading (including the book! ), and commenting; much appreciated.